The Rocky Mountains National Park has been on my list of places to go for a long time. I had seen numerous photos, read about the great American landscapes, the sweeping vistas and high altitude and the Colorado river enough to have wanted to make a visit. The time was right. The trip was planned. My new photography gear had arrived. My travel companions, my family, were all ready. We woke up well acclimatized to the higher altitudes by arriving in Denver two days earlier and and had booked ourselves into the Grand Hyatt on Welton Street. We had walked the 16th Street Mall the day before and this morning we rented a car from across the street at Avis. We were six of us and needed a big SUV. The Toyota Sequoia and its V8 engine was perfect. We picked up breakfast at Panera and headed out. We took I-70 West from Denver and as soon as we hit the highway, I connected my phone to the powerful music system and played my John Denver playlist. It seemed like all those years of listening to his music finally had a meaning. 40 miles on I-70 W and then as we exited to US-40 W and entered the Arapaho National Forest, the song Rocky Mountain High started to play. John Denver and Mike Taylor had written this song in the 70s and the song had seen its share of controversies. But as John Denver himself had said, the high he was referring to was the high he got from the sense of peace he found in the Rockies. Well explained and I concur. The song was officially adopted as one of Colorado’s state songs in 2007. Arapaho National Forest straddles the Continental Divide and our first brush came at the Berthoud Pass, a high mountain pass as 11,307 ft (3446m). This is a treacherous route with many landslides closing the route often but as we sat there getting our first views of the grandeur of the Rocky Mountains and as we caught on our geography reading about the Continental Divide, we were glad the roads were open and we were making this trip. The sense of calm had already set in. A continental divide is a drainage divide on a continent such that the drainage basin on one side of the divide feeds into one ocean or sea, and the basin on the other side either feeds into a different ocean or sea, or else is endorheic, not connected to the open sea. Here, in the Great Continental Divide of the Americas the two basins were the Pacific to our West and the Atlantic to our East. US-40 W leades to US-34 E and this leads you right past Lake Granby, Shadow Mountain Lake and to entrance to Rocky Mountain National Park. We entered from the west side at Kawuneeche Visitor Center. We got our park maps, trail guides, some initial souvenirs and also a Junior Ranger program book for my seven year old daughter. If you have kids, this is a must do. The park rangers helped us plan the rest of our day through the west side of the park and to our pit stop at Estes Park for the night. We retraced our steps back a little into Grand Lake, a charming mountain town with a small main street and non-chain restaurants to grab a bite and headed to our first trail, Adams Falls. Trail 1: Adams Falls. Round Trip: 0.6 mile (1km): Altitude: 8500ft. A beautiful trail starting at the East Inlet Trailhead that leads to the falls. The hike is easy, though rugged, with some scrambling through rocks required. There is an overlook to the falls amidst all the pines and aspens. The falls is named after Jay E. Adams, an early settler in the Grand Lake area who arrived in the late 1800s. Prior to receiving its current name the waterfall was known as Ousel Falls. From Adams Falls, we got back on US-34 E and started our drive up the Trail Ridge Road, 48 miles from Grand Lake to Estes Park, cutting through the Rockies and offering some of the most spectacular views of the mountains. This road climbs to over 12,000 ft and is open only for 4 months in the summer. It is a recognized as the Trail Ridge Road/Beaver Meadow National Scenic Byway in the US park system and was built in 1930! We made our way slowly stopping for multiple hikes and lookout points. Trail 2: Holzwarth Historic Site: 1 mile (1.6km): Altitude: 8905 ft. An even terrain walk through the Kawuneeche Valley, past the Colorado river and to historic homestead cabins built in the 1920s. The cabins are maintained well and have activities to keep you entertained but it is the walk that will leave you breathless with its sweeping views of the valley and the mountains surrounding it. The Colorado river starts only 10 miles northwest in the Never Summer Mountains but travels another 1400 miles south to the Gulf of California. It closes by 4:30 pm so get here first. Trail 3: Coyote Valley Trailhead: 1 mile (1.6km): Altitude: 8885 ft. Look for moose in this wheelchair friendly trail that follows the Colorado river. Our first animal spotting was here as we saw a moose making its way to the river. To the west you will get the best views of the Never Summer Mountains and there are plenty of picnic spots to catch a moment with nature. The river offers fishing opportunities. Standing there in the middle of a huge valley but realizing that you are at 2700m makes you question nature. How is it possible to have this much space at that height? Then prepare to be even more in awe as you read about the glaciers that created these valleys. John Denver’s Annie’s song lyrics seemed to fill the air here. I fully understood how all your senses can be completely filled up. We continued our drive, climbing higher into the alpine region and made a stop at Milner Pass, another mountain pass that is on the Continental Divide. The pass is at 10759 ft and the Poudre Lake offers spectacular reflective views of the surrounding area. We wound around the mountains, making many switchbacks (hair pin bends) that got us closer and closer to the crest of the scenic road. Near the highest point is the Alpine Visitor Center. We arrived after the center closed but with enough light left to climb to the peak. Trail 4: Alpine Ridge Trail: 0.5 mile (0.8km): Altitude: 12005 ft. 225 steps. One of my most favorite hikes in the Rocky Mountains. It is another easy trail, but one with a lot of steps and at an extremely high altitude. I did take a while to adjust, struggling to breathe a little before I saw my kids already at the peak and shouting for me to catch up. It is appropriately named Huffers Hill. Once the lungs adapted it was indeed refreshing to be above the tree lines in this alpine tundra wonderland. Regions above 11400 ft are the Alpine ecosystem. The soil is thin, strong ultra-violet light hits the ground and the air is bitterly cold. This is the tundra. No trees grow here, but there is plenty of life. Flowers grow close to the ground, hugging it for warmth, and Bighorn sheep come here to graze in summer. At the base wildflowers colored the slopes, and as we got to the top we were surprised to see a herd of elk grazing, relaxing and enjoying the 360 panoramic views of the mountains. We kept our distance but my new Samsung 150mm – 600mm lens came to good use. I was able to capture extreme closeups of these majestic animals while also being able to zoom back and see them set against the some of the most beautiful mountain ranges in the world. Back near the parking lot, we ran into more elk and as we started to drive out, we saw even more. As we left the Alpine Visitor Center, the road took some of the sharpest turns and reached its peak and then wound down the mountain even more treacherously. With the car in first or second gear we slowly made our way down, gripping the steering wheel with white knuckles and wanting to get to flatter terrain before sunset. The Trail Ridge Road is one of the highest paved roads in the US and the world, climbing to over 12000 ft. The road is also one of the longest continuously paved roads, 48 miles, at that altitude. It is on the US National Register of Historic Places. We had to drive another 20 miles to leave the park on the east side and enter Estes Park for our night stay but couldn’t see much of the scenery. The Toyota Sequoia was a boon on this drive. The V8 engine didn’t miss a beat and gave me extreme confidence in its handling of the curvy roads. We checked into our hotel, The Ridgeline Hotel Estes Park, and also got our dinner at the attached Latitude 105 Alehouse. The hotel was very comfortable with great resort like facilities, swimming pool, gym, game room, conference centers and restaurants and the alehouse served an impossible burger wrapped in a tortilla that had me glad that I had completed 4 trails that day. Latitude 105, Estes Park, CO – Elk Drool cocktail – rye whiskey, Fig and Hazelnut salad, Tex Mex Burger – burger wrapped in a tortilla! We wanted to hike not drive. Conveniently the Rocky Mountain National Park service manages shuttles that take people into the park from Estes and also runs shuttle routes within the park. We decided to do this in the morning. After a quick breakfast at the hotel, we went to Estes Park Visitor Center and caught the Hiker Shuttle into the National Park. It is generally a good idea to use the shuttles as parking can be extremely difficult within the park in the peak months. From the Park & Ride we took the Bear Lake Route and went all the way to Bear Lake. Trail 5: Bear Lake Trail: 0.5 mile (0.8km): Altitude: 9520 ft. This is one of my most favorite hikes. It is an easy hike but give yourselves at least 2-3 hours as the views, the slight gradient and the multiple opportunities to explore the area will and should slow you down. As we walked around the lake, we could see commanding views of Hallett Peak, Longs Peak, Half Mountain across the lake. The pines are green, the water is blue and mountains pierce the even bluer skies. The Bear Lake area is also a very popular starting point for much longer hikes, so it will be very crowded. There are plenty of frame-worthy photo spots so make sure that you take all your equipment when you go. Bear Lake is in the Subalpine ecosystem. Between 9000 ft and 11400 ft this ecosystem supports wildflowers like arnica, fairy slipper, twinflower and blueberry shrubs. The trees here top out around 100 ft and mainly Spruce and Flat-Needled Fir. The snow from the alpine zone blows down to this region and keeps the ground wet. Woodpeckers tap on the trees and golden-mantled ground squirrels scurry about. From Bear Lake we took the shuttle back to Park & Ride and switched over to the Moraine Park Route and went to Sprague Lake. Trail 6: Sprague Lake Trail: 0.9 mile (1.5km): Altitude: 8700 ft. An easier hike than Bear Lake, with less gradient. The altitude is also slightly lower and as we started the hike, it felt like we were back in the plains. The mountains were hidden and boardwalk made it feel like a local garden walk. Then as we turned a corner, grand views of the Continental Divide, including Half Mountain, Thatchtop Mountain, Taylor Peak, Otis Peak, Hallett Peak, Flattop Mountain and Notchtop Mountain all come into view. The lake is named after Abner Sprague, one of the original settlers in the Estes Park area. Abner Sprague was also the first visitor to pay an entrance fee in 1939. We were getting hungry as there is no option for food within the national park. The only cafe is at the Alpine Visitor Center on the West side. We had protein bars and fruits with us, but needed more strength. We took the shuttle back to Estes Park, and made a pit stop to Safeway. We picked up refreshments and also packed sandwiches and soups. We were not going to sit there and eat when picnic spots with the better views than parking lots were just a few miles away. We took our picnic to the Upper Beaver Meadows Trail picnic area and sat in the valley that we had missed seeing on Day 1 on the way down from the Alpine Visitor Center. The meadows are part of the montane ecosystem, elevations below 9000 ft, and support a wide range of plant and animal life. Plenty of birds served as companions trying to also forage our food but we kept the birds and our food safe from each other. From the parking lot, there are expansive views of Longs Peak and the mountains along the Continental Divide. At lower altitudes, Ponderosa Pines dot the landscape while closer to 9000 ft, it is Douglas-fir and Lodgepole pine. The entrances to the park are all in this ecosystem. On July 15, 1982 at 5:30 a.m. Lawn Lake broke through the terminal moraine that had held since the end of the last ice age, thousands of years ago. The release of 29 million gallons of water swept trees and car-sized boulders four miles down to the valley floor. In addition to tons of lighter rocks, gavel and sand creating a 42-acre alluvial fan. A trash collector heard the waters crashing down the Roaring River and called park rangers, who evacuated campers at Aspenglen campgrounds. Two were lost to the flood at the campground and one along the Roaring River. Much of the flood’s force was weakened while submerging the meadows of Horseshoe Park, but still had enough force to flood the town of Estes Park to a depth of six feet. Lake Estes to the east of town contained the floodwaters preventing further damage. Sediments from the flood dammed the Fall River, forming a shallow 17-acre lake. Unofficially called “Fan Lake” , it has provided new habitats for wildlife displaced by the Lawn Lake flood’s debris. By 1996, Fall River has already begun eroding the lakes temporary dam. Eventually, the lake will drain to create wetlands, meadows and forest. Following US-34 back to Estes we stopped at the Sheep Lakes, hoping to catch our next animal for the trip, the Big Horn Sheep but we did not see any in the area. The views of Mt.Chapin, Sundance Mountain and the sun setting over the valley was beautiful. We then stopped at Fall River Visitor Center and spent time buying souvenirs from the Trading Post. There is a small children’s play area and also a stable if you wanted to rent horses and explore the park. We continued to drive east on US-34 and reached Estes Park and our hotel earlier than day 1. This gave everyone time to relax, use the facilities in the hotel and prepare for Day 3. We ended up playing Jenga. After two days in the National Park, we wanted to start our day at Estes Park. Estes Park, Colorado is the base camp for tourists who come to explore the surrounding parks. Parks is a very commonly used term in Colorado and it has a very local meaning, simply any upland valley. Kentuckian Joel Estes and his wife Patsy were the first residents here, before it was founded in 1859 and incorporated in 1917. Today, this quintessential mountain town sitting at 7522 feet is a bustling town with multiple hotels, resorts, restaurants and theme parks. We ate a relaxed brunch at the Egg and I Restaurant and then headed back into the national park. It was time for our daughter to become a Junior Ranger. The NPS Junior Ranger program is an activity based program conducted in almost all parks, and some Junior Ranger programs are national. Many national parks offer young visitors the opportunity to join the National Park Service “family” as Junior Rangers and my daughter was thrilled to have completed all her activities and earn her badge. We drove to the Moraine Park Discovery Center, an insightful starting point for any visit to the Park. The museum displays highlight the park geology, glacial history, human history, weather and climate, and ecology. Here Ranger Sam spent time talking to my daughter about the national park, the mission to explore, learn and protect and after having her take an oath to do so, made her an official Junior Ranger. She was thrilled. Moraine Park Discovery Center also offers various activities for kids of all ages, from coloring, to a animal detective game, to making your own castings of animal feet. There is also short 0.3 mile nature hike around the center, that highlights all the major ecological and geographical features of the park. 40 to 70 million years ago, crashing tectonic plates gave birth to the Rocky Mountains, and through the years glaciers have shaped them. 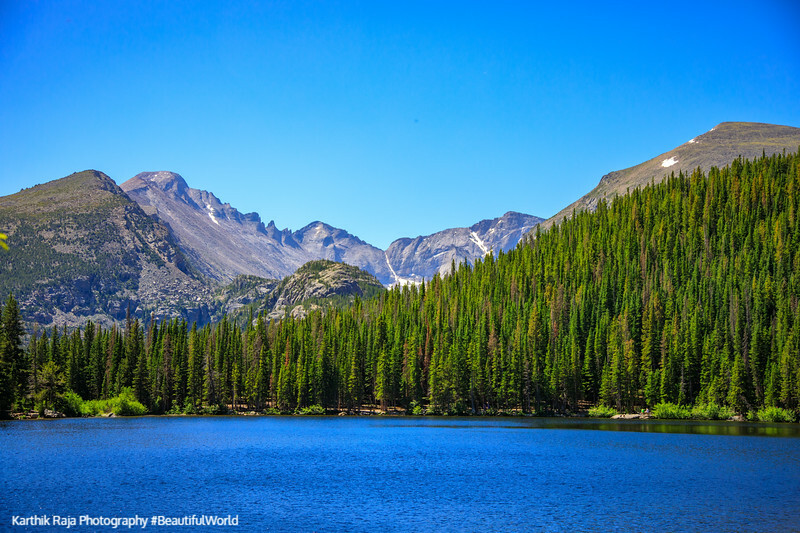 More recently, in 1915, the Rocky Mountain National Park (RMNP) was established. The park encompasses tens of mountains over 12000 ft, is home to hundreds of bird species and over 50 animals. There are three ecosystems within the park, and plant life thrives in all of them. The park is now one of the Top 5 most visited national parks in the US and is fun through the year for different activities. This is a very easy morning walk, and the perfect way to leave the park with vistas that will truly be etched in your minds. There are plenty of benches to sit, reflect, and take your own personal oath to explore, learn and protect nature and everything that is around us. Getting high up in the Rocky Mountains is the most natural way to let go of all your worries, and see the earth for what it is. Beautiful. We returned to Denver, via the highway, stopping in Boulder to celebrate July 4th festivities. Google Maps of our Itinerary. Click on the map to enlarge or on the top left to interact and see all the places on the map. Next Pikes Peak Region and the Garden of the Gods. A must do day trip from Denver. Great trip and photos. Hope to get to Rocky Mountains NP someday. Definitely on my list.